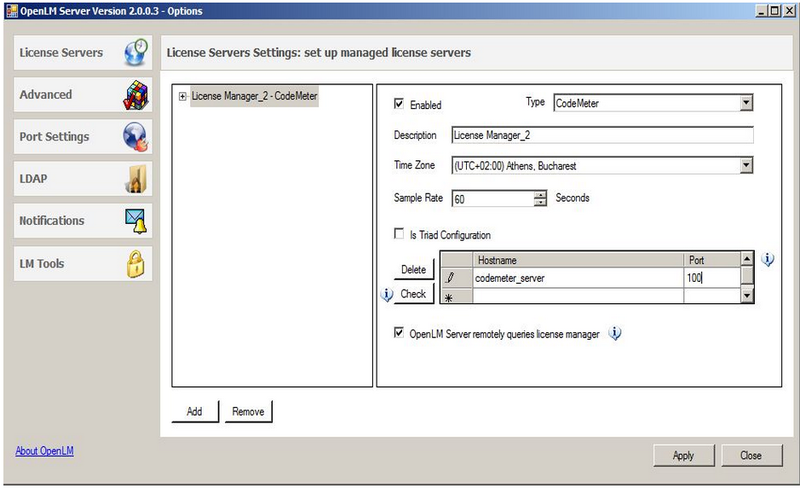 This is a description of the basic procedure for configuring the OpenLM server to interface a Codemeter license manager, to monitor license usage, and extract Codemeter license usage statistics. The OpenLM System components are available for download on the OpenLM site. Start the installation process by installing the latest OpenLM server version. Please refer to this Application Note for a general description of the OpenLM system. 1. Select the LM Tools tab, located on the left pane. 3. Copy the Codemeter executable file CMU.exe to the OpenLM LM folder. This is normally located at C:\Program Files (x86)\OpenLM\OpenLM Server\LM . 5a. Select the License Servers tab, and click Add. Checked (Default): The OpenLM Server actively queries the license manager. Check this box when the OpenLM Server is installed on the same machine as the Codemeter server. Unchecked: Usage information is obtained solely by the OpenLM Broker installation on the License manager machine. Uncheck this box when the OpenLM Server is NOT installed on the same machine as the Codemeter server. In that case – the OpenLM Broker will need to be installed on the Codemeter license server machine to obtain usage information. 5h. Click Apply, and then consecutively the Restart now button. In case the OpenLM Server is not installed on the same machine as the Codemeter server, the OpenLM Broker will need to be installed on the Codemeter server machine, in order to query the Codemeter license usage locally. 1. Set the OpenLM server hostname (e.g. : My_OpenLM_Server). 2. 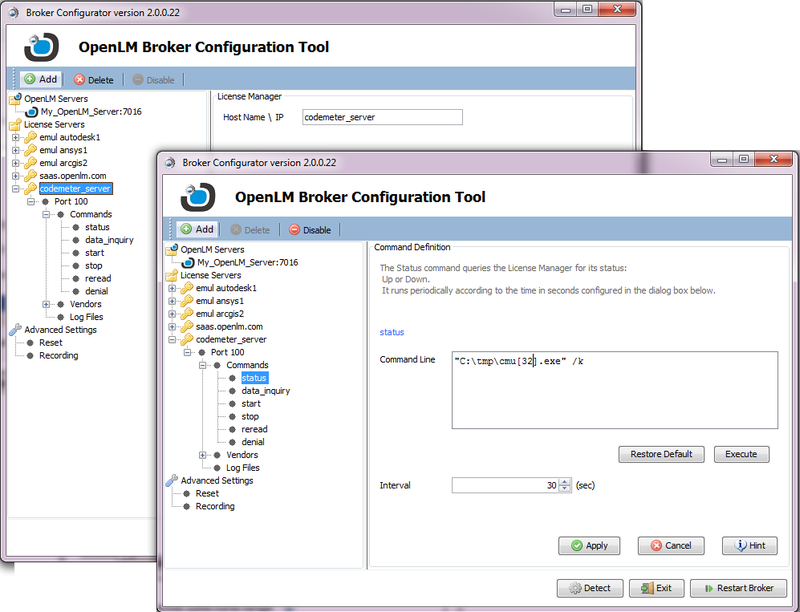 Set the OpenLM Broker port number (e.g. : maintained at its default value 7016). 4. Type in the Codemeter command line in the Broker’s “data_inquiry” command text box. This command should be “<Full path to CMU>\CMU.exe” /n. 5. Click ‘Execute’ to check the operation of the Data Inquiry, and click ‘Apply. The OpenLM Server now interfaces the Codemeter license manager. Check the OpenLM report of the Codemeter license usage. Click EasyAdmin Start → Management → License servers. The License Servers window appears. Verify that the configured Codemeter license manager appear on the list. A green circle node indicates an active connection to a license server. The OpenLM Server is now set to monitor the Codemeter license manager.